A somewhat different approach to ESDA for continuous data represented as a point set with z-values is to examine whether any simple trends are present. 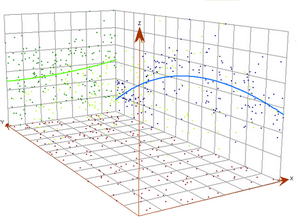 For the radioactivity point set illustrated in Figure 5‑13 a simple 3D trend analysis is shown in Figure 5‑14. This diagram shows the point set mapped in the XY-plane, with the radioactivity levels (z-values) projected onto the XZ- and YZ-planes. Simple low-order (2nd degree) polynomial trend curves have then been fitted to these projected datasets, providing a useful pre-analysis visualization of possible trends. Again, as with the forms of ESDA described earlier, points in this visualization may be brushed and associated representations highlighted through linking. Trend analysis of the kind illustrated here uses the basic methods of curve fitting applied in regression modeling (see further, Section 5.6, Spatial Regression).